Flavoured and coloured, this meringue sundae is far easier to make than it looks. 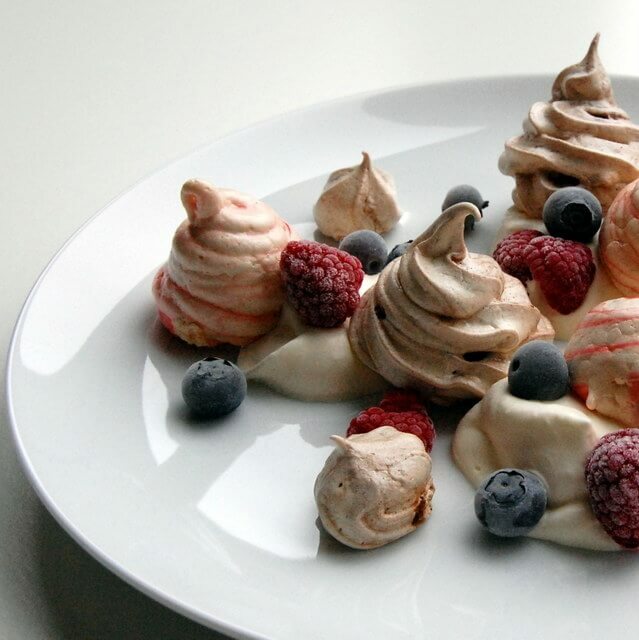 I’ve been working on this recipe for a “sundae” style meringue since I tasted a gorgeous chocolate meringue from The Tipperary Kitchen at Bloom 2012. I’m not sure that these are identical but they come darn close! Meringues are bribery material. Be it a pavlova, meringue nests or eton mess, if I mention they’re on the menu I somehow manage to get double the usual number for dinner or a celebration. In fact after finishing these today I sent a text to my brother in law, he landed on my doorstep 10 minutes later. There is however one person who makes the best meringues in the family, and that’s my Aunt, Mary. She has such a light touch, loves piping them out into perfect swirls, and they taste amazing. I’m hoping that by the time I’ve practised my meringues as often as she has that I will be able to do the family reputation for meringues justice! 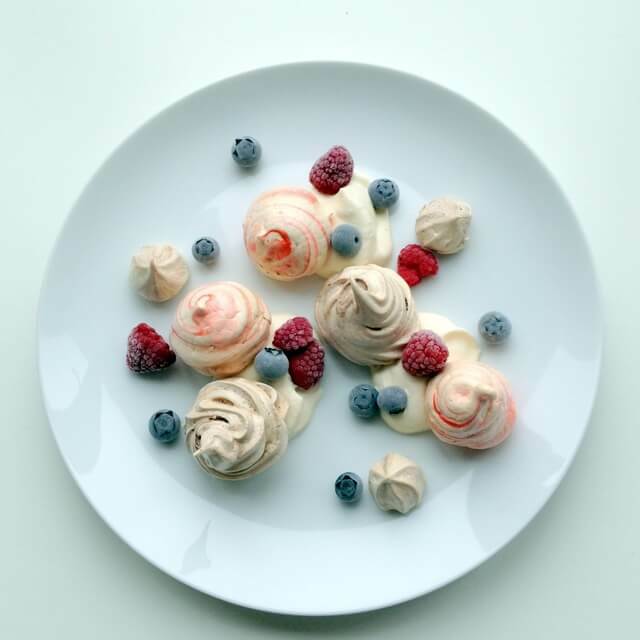 Some meringue and pavlova recipes I’ve come across use the 2 core ingredients; egg white & caster sugar, but to be honest the trick to making good meringues are a clean metal bowl & whisk, fresh egg whites at room temperature and not opening the oven! Last night I made two types of meringues; plain with some red food colouring inside the piping bag to get the pink swirl effect, and chocolate with cocoa powder. I’m giving you the recipe for plain meringues and then it’s up to you whether you would like to add extra flavourings to it. This recipe makes approximately 30 kiwi-sized meringues, you can pipe them out using a bag or if you’re not of the patient type it’s fine to use a teaspoon to spoon them onto the greaseproof baking parchment. To make the chocolate meringues put 2 tablespoons of cocoa powder (unsieved) directly on top of your meringue mixture after whisking. Do not stir, and simply spoon directly into the piping bag. Just to note that good quality meringues are virtually impossible without an electric whisk of some sort. Cut your baking parchment to size of the 2 baking trays. Line them and then leave to one side. Place the 4 egg whites into the mixer and whisk (using the whisk attachment) until they nearly treble in size. They will turn a solid white colour. Keep whisking and slowly add the sugar tablespoon by tablespoon until it is all mixed into the egg whites. Turn the whisk on high and whisk for a further 3 minutes. Turn off the whisk and check the mixture. It should form stiff peaks – i.e. it should not slouch back into place if you move it with a spoon. If you have stiff peaks, then spoon into a piping bag and pipe out your meringues. If not repeat step 5 above. Place the piped meringues into the oven and set your timer for 90 minutes. After 90 minutes, turn the oven down to 100 degrees Celcius for a further 30 minutes. So after 2 hours in total, turn the oven off completely and leave it alone. DON’T open the oven at any point from when the meringues go in until it is completely cool. This is why meringues are best made the night before eating them. Serve with fresh cream & berries!